This would be a useful topic. 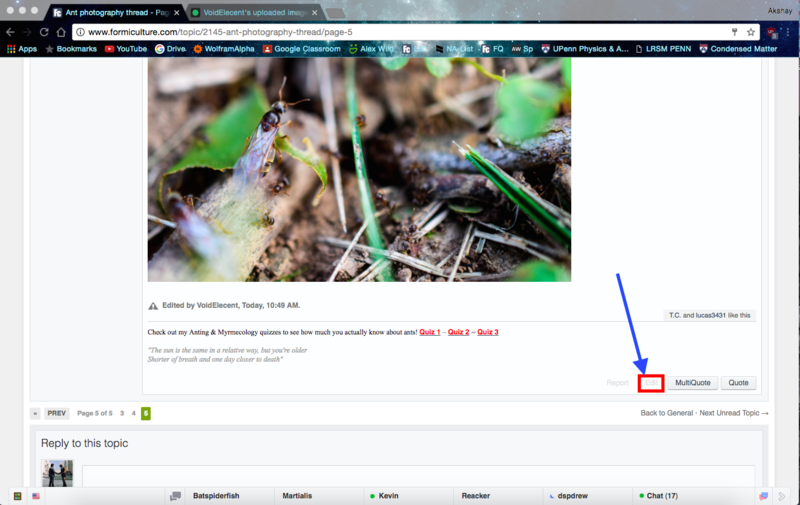 I have some photos I could post, but could use some specific instruction on how to paste into a comment or topic. Edited by dspdrew, November 4 2014 - 7:53 AM. 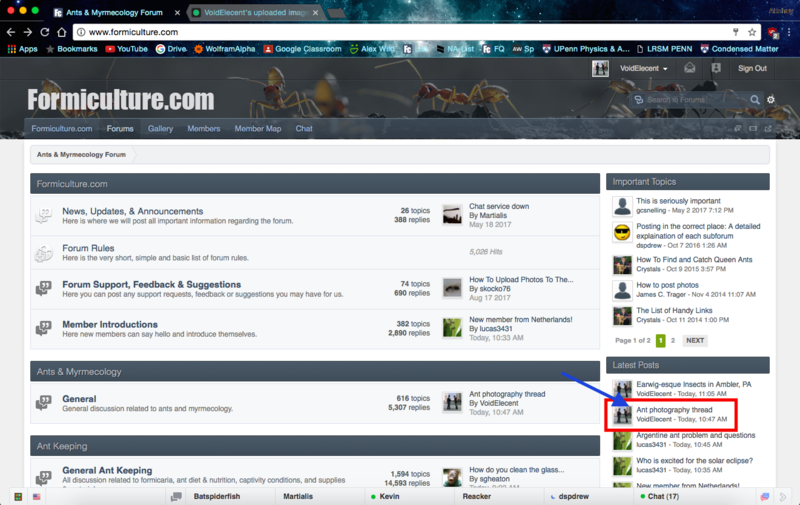 Changed the title of the topic to better suit the resulting content. 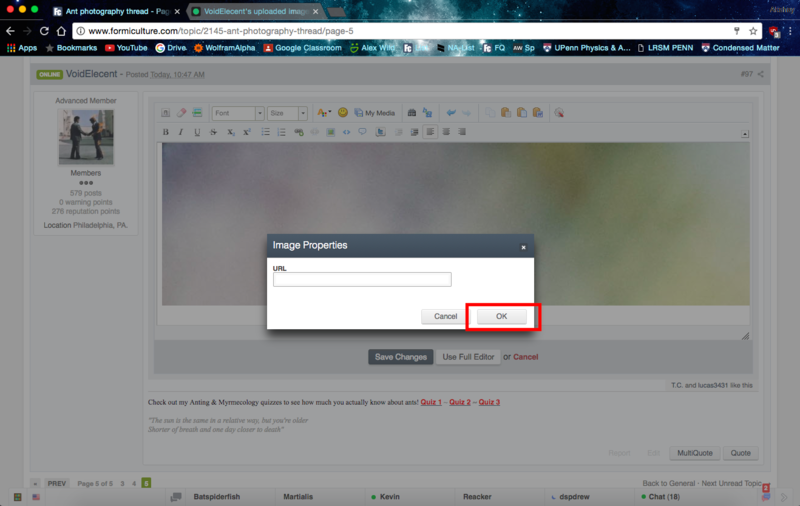 I believe the easiest way is to upload your pictures to an image hosting site. Photobucket works best, in my opinion. 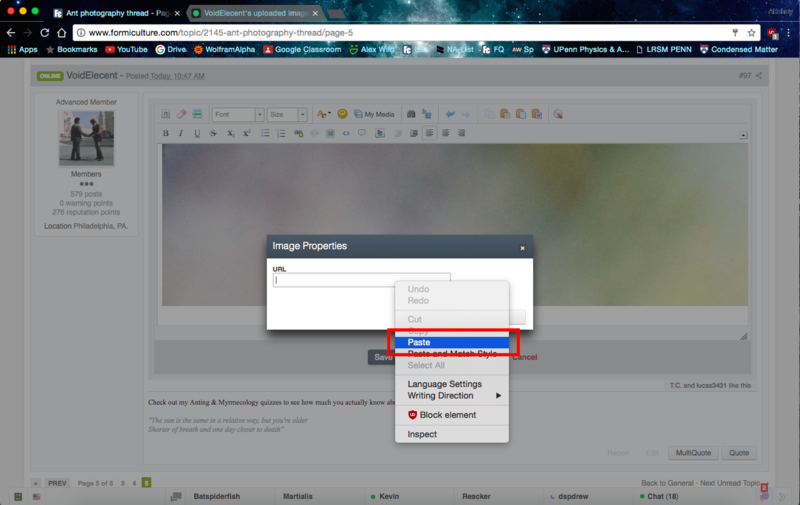 Once your pictures are uploading to the site of your choice there should be an option to copy it's direct link. 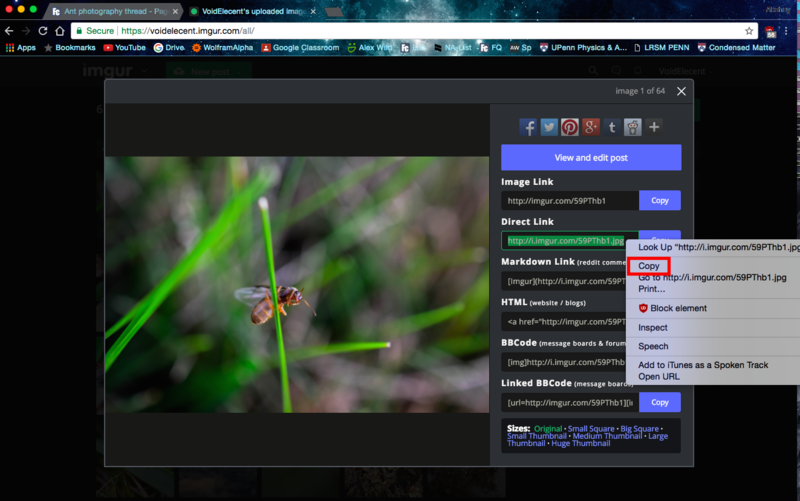 You can then click on the "image" icon right above the comment section, here on the forum, which will then give you a space to paste your image's URL there. Your images should show up nice and big. I don't know how to condense a lot of pictures into a single file though, so maybe someone else can help you in that area if you need. Posting images here is mostly the same as other forum software. Here, there are three main methods. I'll list them in the order that I would recommend them be used. 1. 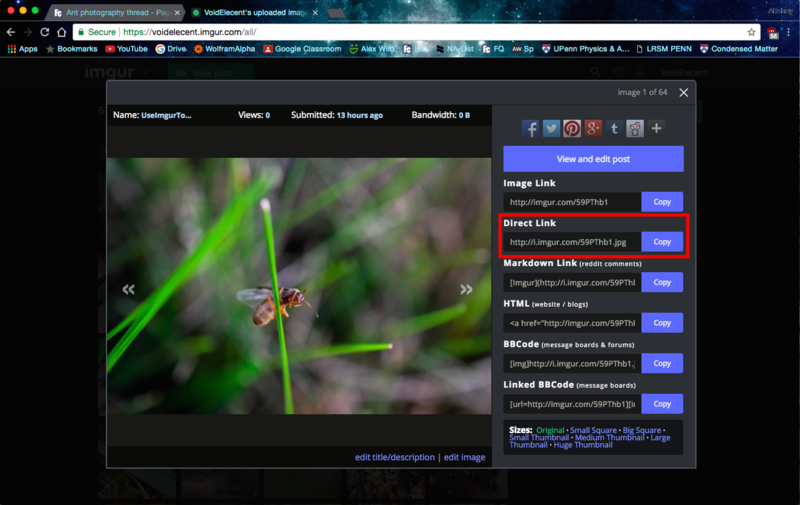 Find an image host (eg: Imgur, Flickr, Photobucket), and upload your pictures. You can even use the Formiculture.com gallery to host your pictures if you want (more about that later). 2. Find the direct URL to the image file, which usually ends with an image file extension (eg: .jpg, .png, .gif). Some sites will specifically give you this URL, others you may have to obtain it yourself by pulling up the image in your browser and then copying the address. 1. 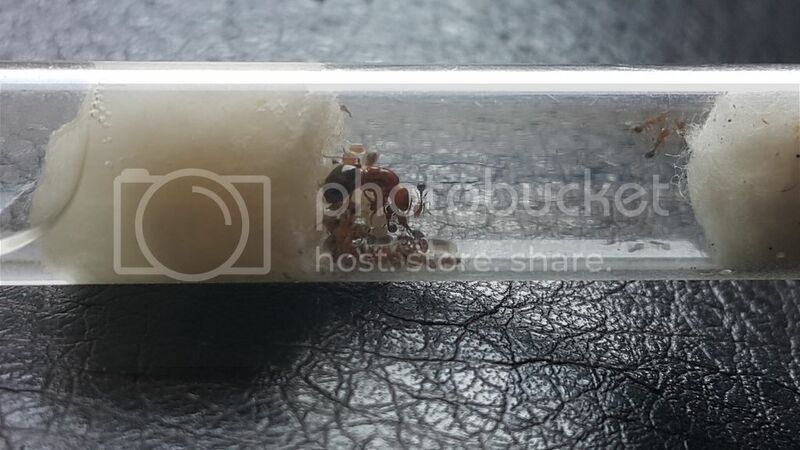 Upload your image to the Formiculture.com gallery. 2. While typing your post, click the "My Media" button near the center of the top toolbar of the graphical editor, then find and select your image. 1. Simply paste the direct URL to the image into your post (for this method, only URL's ending in .jpg, .png, or .gif will work). Thanks, I'll try at least one of those, soon. I would like to calmly say....... photobucket!! !, so now I have to use a different image host because of money, well time to re upload almost six thousand photos again. Edited by lucas3431, August 1 2017 - 12:35 PM. That's why I don't use public web services. if you have office 365 you have 1 TB onedrive space (and if you don't you still have some GB I think). You can embed images stored there too. Edited by Barristan, August 5 2017 - 1:51 PM. 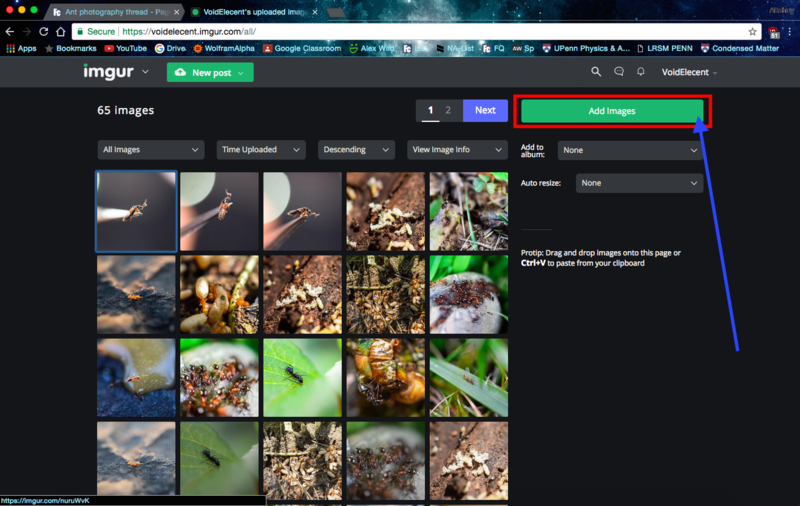 Drew has made it so that images stored on Google Drive seamlessly display on the Forum, simply by posting the URL of the publicly shared file. 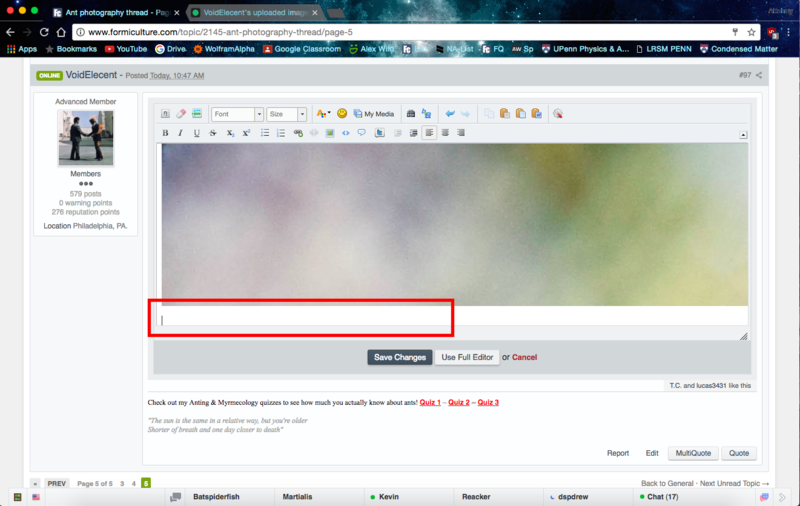 Note: Unlike the example URL, the last part of the URL must be "view?usp=sharing" for the forum to auto display the image. If you're extracting the link from the desktop app or online, then it usually defaults to "sharing;" however, if you're using the Android app, it may appear as "drivesdk," in which case the "drivesdk" must be changed to "sharing" to work with the forum. 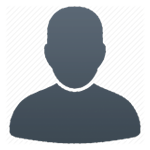 Files must be shared publicly to display on the forum. Edited by drtrmiller, August 6 2017 - 4:38 PM. Yaaay after 10 or so tries I finally got it. Thanks drtmiller, Barristan and Drew. Edited by lucas3431, August 6 2017 - 3:18 PM. Edited by Gabraime, August 6 2017 - 8:39 PM. Edited by Gabraime, August 6 2017 - 8:59 PM. Edited by Gabraime, August 6 2017 - 2:42 PM. It takes a few times to get it. Nice dog. It's really not a good idea to just post the URL. Using the image button is the best way to do it. Edited by Gabraime, August 6 2017 - 8:54 PM. Edited by Gabraime, August 6 2017 - 9:29 PM. Edited by Gabraime, August 6 2017 - 9:30 PM. I have noticed that I can't disable the download option tab that is added to the sharing photo. I'm having a sync issue at the moment so I've reinstalled Google Drive so now I have double folders haha. When is has finished syncing I'll sort out the mess. It is still very useful. Here is a photo guide with a video demonstrating the process of embedding images from imgur to Formiculture. 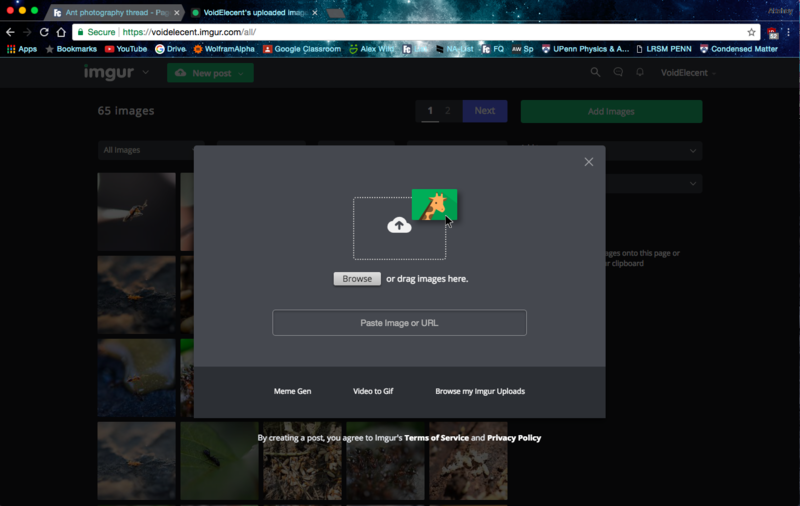 Please note, this doesn't work with Photobucket anymore so imgur is probably the way to go. STEP ONE: Figure out where you want to post the photo. You don't necessarily have to edit a previous thread to post a photo, I just had a picture I forgot to publish with my addition to the Photography Thread. It works the same way with brand-new threads, too. 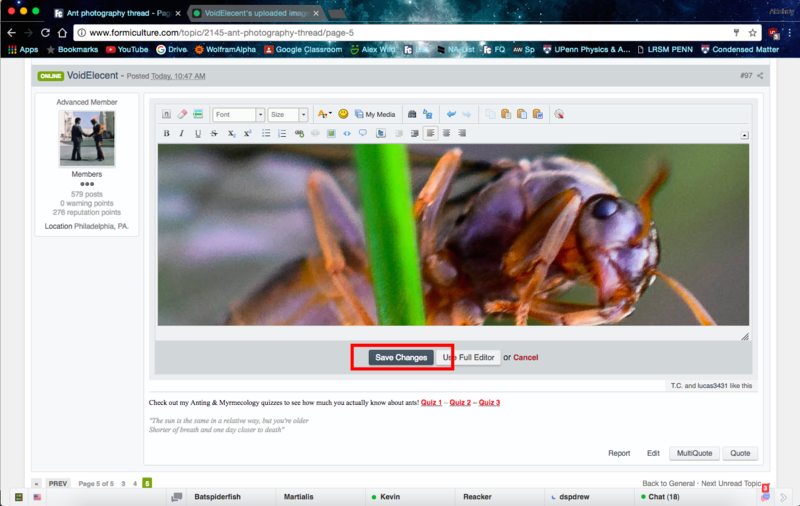 STEP TWO: Click 'edit' to add photos to an existing post. Like I said, you can skip this step if you're publishing a new thread. STEP THREE: Decide where you want the photo to go. Self-explanatory, I don't expect most of you to get stuck on this part. STEP FOUR: Upload the photo to imgur. There are a few ways to do this. 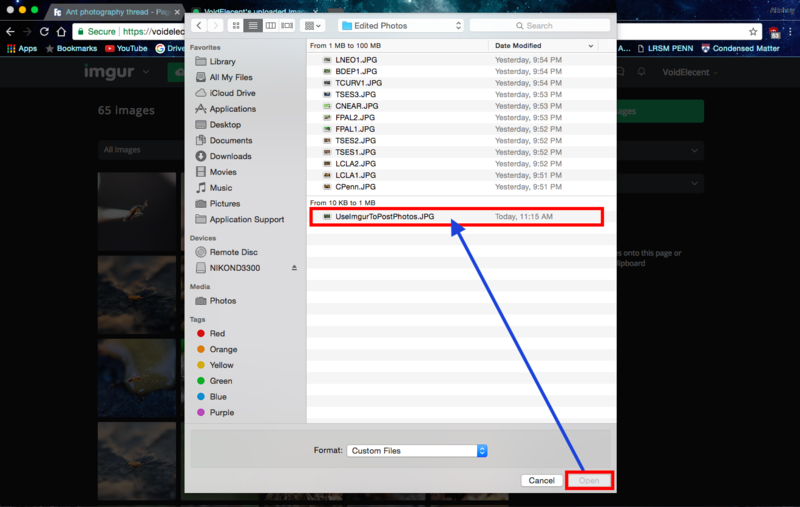 You can pick the photo right out from your drive using the 'browse' function, or simply drag & drop it, which is what I usually do. STEP FIVE: Copy the photo. Once the photo as shown up in your feed, you can select it. Once selected, six different links will be available for you to choose in order to share it. In this case, we want to choose the link titled 'Direct Link'. 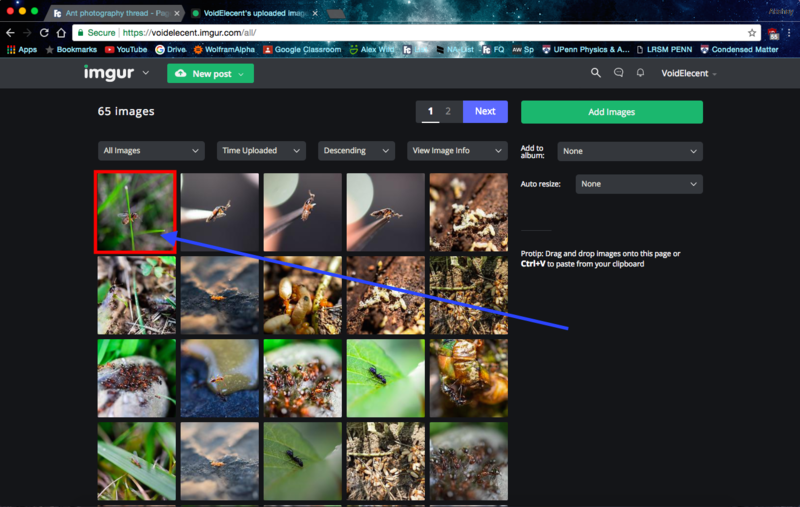 There are several ways to copy a photo; you can click the 'copy' button beside the link (which doesn't usually work for me), you can right click the selected link and choose 'copy' from the dropdown menu, or you can press command+C (shortest and easiest in my opinion). STEP SIX: Embed the photo into your post. To embed the image, you need to click the little square button in-between the break hyperlink and arrow buttons. It looks like a little picture; it's hard to miss. Once you've clicked the square button, paste your link into the pop-up window. Once again, there are several ways to paste text; I'd recommend right-clicking the photo and using the dropdown menu, or using command+V. Once you've pasted it, you can click 'OK' and the photo should pop up right where you wanted it. I do hope this helps eliminate confusion regarding posting embedded photos on this forum. Edited by VoidElecent, August 21 2017 - 11:22 AM.